Human papillomavirus (HPV) is considered as a major cause of cervical cancer., It stands as a most common risk factor associated with the disease. Papillomaviruses comprise a large family of viruses; more than 300 papilloma viruses have been identified and completely sequenced including over 200 HPVs. These adenoviruses have been extensively investigated for decades because of their ability to breakdown cellular mechanisms of growth control. HPVs were as first implicated in cancer biology by causing cervical cancer. HPV belongs to papillomaviridae family which is nonenveloped, small double-stranded DNA virus with approximately 7900 base pairs. The open reading frame of late capsid gene (major capsid protein L1) has been chosen as the standard for papillomavirus classification. The types of HPVs that cause cervical cancer belong to the alpha group and are defined as high-risk HPV. The low risk of HPV from the same group is associated with benign warts. The life cycle of genital HPV requires the availability of the basal epithelial cells of the mucosa of the an ogenital tract that are still able to proliferate. Integration of high-risk HPV into the host cellular genome is considered as the important event in the pathogenesis of cervical cancer. It is related to the progression from premalignant to the invasive carcinoma. Although cervical cancer is preventable and curable, most cases are presented at advanced stages. As a result, those cases need more extensive chemotherapy and radiation therapy. This situation is due to the lack of a proper screening program. The screening tests for cervical cancer include the visual examination with acetic acid visual inspection with acetic acid and the Pap smear More Details. The major problem of the two methods is the low sensitivity to detect high-grade precursor lesion, which requires frequent testing. There are two new preventive approaches emerged over the last decades. First, the vaccination for the primary prevention of HPV infections, and the second is the early detection of infection with HPVs. The challenge lies in identifying the HPV infection of precancerous lesions and early-stage of cervical cancers., The detection of HPV may occur by nonmolecular techniques such as ELISA, which is not sufficiently sensitive or specific to be adequate for routine clinical diagnosis. The molecular techniques based on the hybridization of the target HPV DNA is an encouraging method to detect HPV with high sensitivity and specificity. Due to the lack of data on HPV infection in cervical cancer patients in Libya, we investigated the presence of HPV in fixed cervical tumors by polymerase chain reaction (PCR). The obtained data were analyzed and correlated with the patient's clinical data such as the age and the stage of cervical tumors. The study was designed to investigate the HPV infection status in cervical cancer tissues collected from Misurata Cancer Center and Tripoli Medical Center. The formalin-fixed paraffin-embedded (FFPE) tissues were used to extract genomic DNA which is analyzed by PCR for HPV detection. The obtained data on the HPV infection is correlated with the clinical information of the cervical cancer patients. A total of 38 (hysterectomy and biopsy) FFPE samples of cervical cancer tissues were collected during 2010–2015. The tissue samples were taken from cervical cancer patients aged from 34 to 80 years with median of 51 years. The stages of the cervical cancer tumors were examined by the Department of Histopathology at Misurata Cancer Center. The stages were ranged between IA and II B according to the International Federation of Gynecology. Thirty-four of the samples were tissues of squamous cell carcinoma, 3 samples were adenocarcinoma, and one was severe dysplasia of the cervix. The medical reports obtained from histopathology departments have shown that most of the samples were in Grade III. Five samples of cervical tissues from healthy women were tested as a control group of this study. DNA was extracted from few sections of FFPE cervical tissues using the QIA amp DSA DNA FFPE Tissue kit (Qiagen, Germany) according to the manufacturer's instructions. DNA samples were electrophoresed on 1% agarose gel prepared in 1X TAE buffer (Tris base, Acetic acid, and EDTA) to check their integrity and staining with ethidium bromide. DNA was visualized under UV light using Multidoc-It digital imaging system (UVP Company). DNA from each sample was amplified by PCR with the primer sets specific for HPV and beta-glubin (β-globin) genes. The primers were previously described by Siddiqa et al. Primers of β-globin were used as a control to eliminate the false results by checking the quality of DNA by amplifying the housekeeping gene. The primers – GP5+ and GP6+ were used to detect a large spectrum of genital HPV specific for L1 region. The target genes were amplified using Taq PCR Cora Kit (Qiagen, Germany). The reaction mixture of 25 μl contains 0.2 mM of dNTPs, 1.5 mM MgCl2, 0. 5 μM of reverse and forward primers, 1.25 U of taq DNA polymerase, 5 μl of taq DNA polymerase buffer, 250 ng of genomic DNA, and distilled water. The primers used to amplify β-glubin gene were forward primer – 5' ACACAACTGTGTTCACTAGC 3' and the reverse primer – 5' CAACTTCATCCACGTTCACC 3'. The primers used for the amplification of L1 region of HPV were forward primer – 5' TTTGTTACTGTGGTAGATACCAC3' and the reverse primer – 5' GAAAAATAAACTGCAAATCATATTC 3'. The PCR cycling parameters were composed of a 15 min initial denaturation at 94°C, followed by 40 amplification cycles of 1 min at 94°C, 2 min at 40°C, and 1 min at 72°C, and a final extension step at 72°C for 4 min. The PCR products were visualized on 1% agarose gel electrophoresis. The study was approved by the Ethics Committee of Misurata Cancer Center, Libya. Written informed consents were obtained from patients before enrollment into the study. The collected blocks of FFPE tissues of cervical tumors and control tissues were subjected to genomic DNA extraction. The quality of the extracted DNA samples was assessed, and the concentrations of DNA were determined. 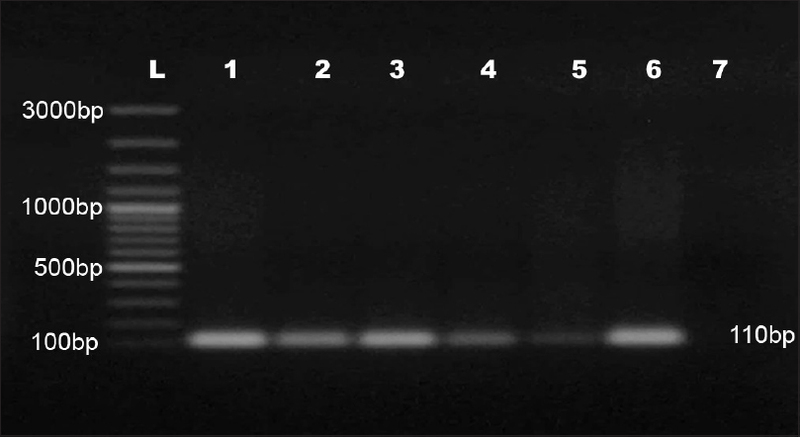 The genomic DNA samples were visualized by ethidium bromide-stained agarose gel electrophoresis to ensure the quality of DNA as shown in [Figure 1]. The gel demonstrated the integrity of the extracted genomic DNA and its intact structure without degradation. This extracted DNA was prepared for PCR analysis. The DNA samples were examined for the amplification of the housekeeping gene, β-glubin, using specific primers. The results of PCR reactions indicated the amplification of β-glubin fragment in the size of 110 bp as expected according to the primers' design. The DNA extracted from both benign and cancer cervical tissues have amplified the same fragment of β-glubin gene [Figure 2]. The detection of HPV genes in cervical tissues from cancer patients and healthy women was carried using PCR technique. The designed forward and reverse primes (GP5 and GP6 respectively) code for L1 region of the virus. The two primers used in this experiment are amplified in the majority of HPV types. The results showed the amplification of the L1 gene at the size of 150 bp. Most of the cervical cancer tissues investigated in this study have shown the amplification of HPV gene indicating the presence of the virus. The HPV was found in tissues of 27 patients of cervical cancer tissues (71%). 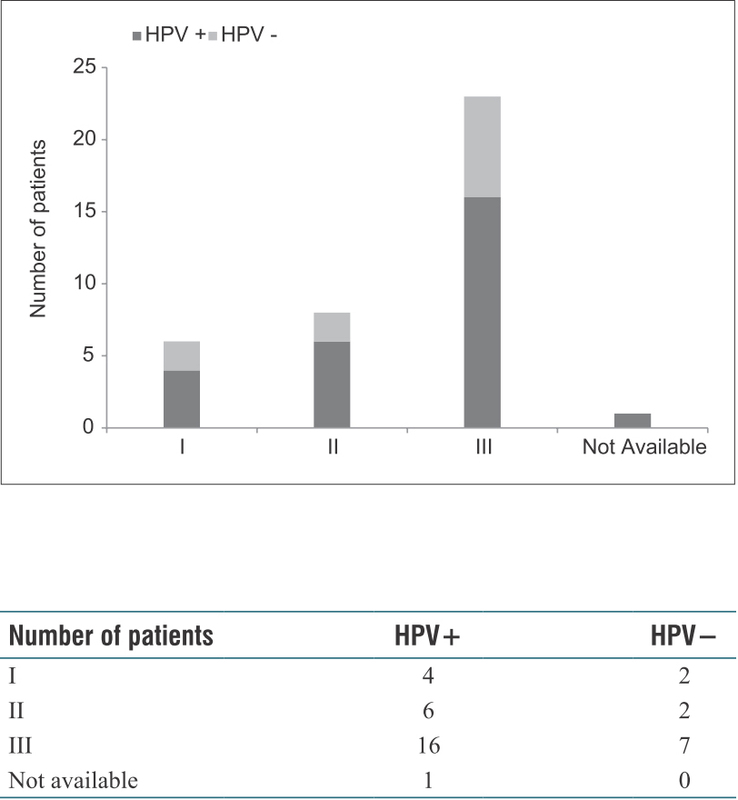 However, HPV gene was not detected in 11 patients diagnosed with cervical cancer (29%) as shown in [Figure 3]. Our studied samples of tumor tissues were diagnosed and classified into different types of cervical cancer. 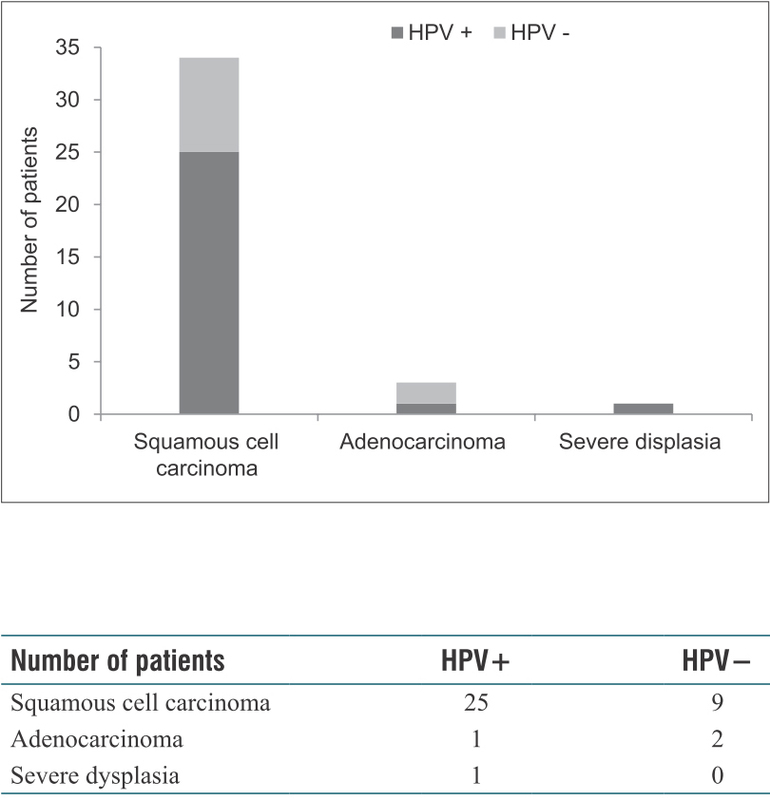 We found the presence of HPV in squamous cell carcinoma (73%, 25/34), adenocarcinoma cases (33%, 1/3), and severe dysplasia samples (100%, 1/1). The detection of HPV virus in different types of the virus is shown in [Figure 4]. The studied cervical tissues confirmed their staging and ranged mostly in Grade III (n = 23). HPV infection was found in 69.56% of Grade III cervical tumors (16/23). Cervical tumors from other grades also harbor HPV as shown in [Figure 5]. We have looked into the infection of HPV in different age groups of the studied cervical cancer patients. The average age of cervical cancer patients subjected to our study was 51 years. The age group of 41–50 years showed the highest HPV infection according to the tested cases [Figure 6]. Diversity of HPV spectrum and its strong association with cervical cancer made it necessary to establish methods for the detection and identification of the various HPV genotypes not only for epidemiological investigations but also for patient management and selection of antiviral treatment and vaccines. There is an increasing interest in the use of nucleic acid amplification testing for HPV identification and typing. 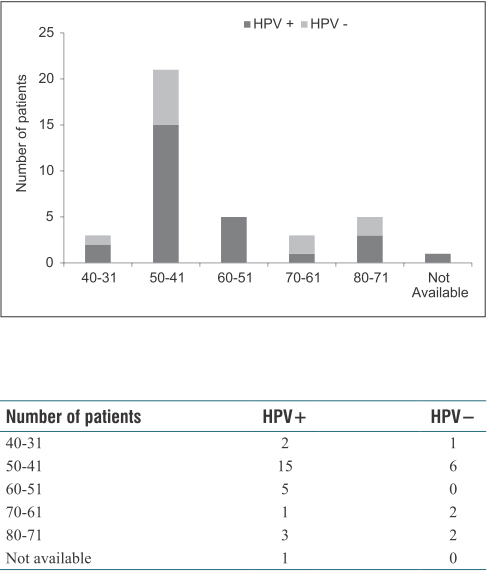 We conclude that HPV infection is present in 71% of Libyan cervical cancer patients. PCR-based molecular technique provides a promising method to screen the virus. HPV was found in different types of cervical cancer tumors including squamous cell carcinoma and adenocarcinoma. In addition, the HPV was found mainly in tumors at Stage III (69%) and other stages of the disease. The age group of 41–50 years of patients showed the highest incidence of HPV. Detection of HPV is an important step for the national screening program of the virus in women at the adult and old ages. The prevalence of HPV in cervical cancer patients is an essential approach to estimate the cervical cancer rate and suggest the best strategies to eliminate the virus infection in women. Further studies with a large group of cervical cancer patients using DNA sequencing are needed to better assess the distribution of the high-risk HPV types. We thank the medical staff at the pathology department in both Misurata Cancer Center and Tripoli Medical Center, especially Dr. Taha Bensaud and Dr. Fatima Maetig, for providing the cervical tissues and the medical reports. We appreciate the support from Mrs. Asma Alelish: Faculty of Science-Misurata University and Dr. Ali Ehwidi, Dr. Wafa Yousef, Wafa Ibrahem: Department of gynecology, Misurata Cancer Center, during the study. The funding of the research was provided by Biotechnology Research Center, Misurata, Libya. This manuscript has no conflict of interest with any company or other organization. Biryukov J, Meyers C. Papillomavirus infectious pathways: A comparison of systems. Viruses 2015;7:4303-25. Al Moustafa AE, Al-Awadhi R, Missaoui N, Adam I, Durusoy R, Ghabreau L, et al. Human papillomaviruses-related cancers. Presence and prevention strategies in the Middle East and North African regions. Hum Vaccin Immunother 2014;10:1812-21. Ahmed HG, Bensumaidea SH, Ashankyty IM. Frequency of human papilloma virus (HPV) subtypes 31,33,35,39 and 45 among Yemeni women with cervical cancer. Infect Agent Cancer 2015;10:29. Egawa N, Egawa K, Griffin H, Doorbar J. Human papillomaviruses; epithelial tropisms, and the development of neoplasia. Viruses 2015;7:3863-90. Adams AK, Wise-Draper TM, Wells SI. Human papillomavirus induced transformation in cervical and head and neck cancers. Cancers (Basel) 2014;6:1793-820. Xue J, Vesper J, Radosevich A. Human Papillomavirus: A Brief Averview, in HPV and Cancer. Netherlands: Springer; 2012. p. 1-15. David M, Chithra P, Mahesh R, Balakrishna S. Oral human papillomavirus infection. Insight 2017;3:1-9. Fields N, Mahan D, Howley M. Papillomaviruses, in Fields virology. Library of Congress Cataloging-in-Publication Date; 2013. p. 1662-703. Ruttkay-Nedecky B, Jimenez Jimenez AM, Nejdl L, Chudobova D, Gumulec J, Masarik M, et al. Relevance of infection with human papillomavirus: The role of the p53 tumor suppressor protein and E6/E7 zinc finger proteins (Review). Int J Oncol 2013;43:1754-62. Cubie HA. Diseases associated with human papillomavirus infection. Virology 2013;445:21-34. Wooden C, Collins S, Young L. The natural history of cervical HPV infection: unresolved issues. Nat Rev Cancer 2007;7:11-22. Xue J, Vesper J, Radosevich A. HPV and Cancer. Netherlands: Springer; 2012. p. 40-74. Alsbeih G, Al-Harbi N, El-Sebaie M, Al-Badawi I. HPV prevalence and genetic predisposition to cervical cancer in Saudi Arabia. Infect Agent Cancer 2013;8:15. Kisseljov FL. Virus-associated human tumors: Cervical carcinomas and papilloma viruses. Biochemistry (Mosc) 2000;65:68-77. Alsbeih G, Ahmed R, Al-Harbi N, Venturina LA, Tulbah A, Balaraj K, et al. Prevalence and genotypes' distribution of human papillomavirus in invasive cervical cancer in Saudi Arabia. Gynecol Oncol 2011;121:522-6. Goodman A. HPV testing as a screen for cervical cancer. BMJ 2015;350:h2372. Siddiqa A, Zainab M, Qadri I, Bhatti MF, Parish JL. Prevalence and genotyping of high risk human papillomavirus in cervical cancer samples from Punjab, Pakistan. Viruses 2014;6:2762-77.
de Sanjose S, Quint WG, Alemany L, Geraets DT, Klaustermeier JE, Lloveras B. Human papillomavirus genotype attribution in invasive cervical cancer: A retrospective cross-sectional worldwide study. Lancet Oncol 2010;11:1048-56. Forman D, Martel C, Lacey C, Soerjomataram I, Lortet-Tienlent J, Bruni L, et al. Global burden of human papilloma virus and related diseases 2012;30:12-23. AlObaid A, Al-Badawi IA, Al-Kadri H, Gopala K, Kandeil W, Quint W, et al. Human papillomavirus prevalence and type distribution among women atten'ding routine gynecological examinations in Saudi Arabia. BMC Infect Dis 2014;14:643. Bruni L, Diaz M, Castellsagué X, Ferrer E, Bosch FX, de Sanjosé S, et al. Cervical human papillomavirus prevalence in 5 continents: Meta-analysis of 1 million women with normal cytological findings. J Infect Dis 2010;202:1789-99.